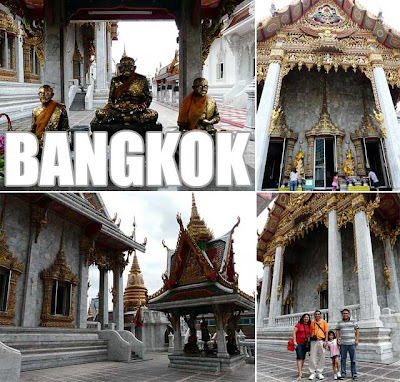 Bangkok is one of my favorite Asian cities. And I found myself back again in Bangkok for a family vacation. I'm not a fan of package tours for international trips. But in this instance, it was cheaper and more convenient, especially since my niece was with us. It was my first time to see Bangkok's impressive new airport, the Suvarnabhumi Airport. We had a half-day city tour as soon as we arrived. We were first taken to a relatively new temple (I was not able to get the name since it's not in the usual tourist radar when visiting Bangkok). But for people who've seen a Thai temple for the first time, I'm sure it looked impressive. Since we were to visit two temples, I had requested our guides to take us to Wat Pho, the oldest and one of the largest temples in Bangkok. Said to be the birthplace of Thai massage, it's most known for its gargantuan Reclining Buddha which is 46 meters long and 15 meters high. Another element of this temple compound which I find equally impressive are four large chedis or stupas dedicated to the first four kings of Thailand's Chakri Dynasty, Rama I, II, III, and IV. Each is 41 meters high and intricately decorated with tiles. And just like in any tour, they brought us to a jewelry shop! At least it wasn't as bad as our Hong Kong-Shenzen tour. We didn't stay up late since we want to be in Chatuchak Market early tomorrow to shop! Thanks! I want to visit northern Thailand next time I visit. I'm always in Bangkok! Haay! Hehe! reminds me of my bangkok trips, my last one was 2 years ago (for 15 years, bkk was my transit point, it was like i was in bkk many times a year, more than 10x a year), still i did not tire going back to temples and the grand palace. beautiful pictures you have again! It's been years since my last trip to Bangkok. I hope to visit soon! 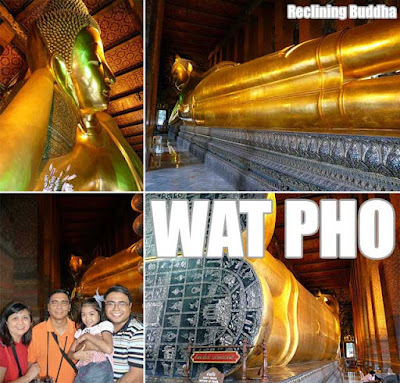 Did you go to Ayutthaya? If you did, please post some photos here. Thanks.